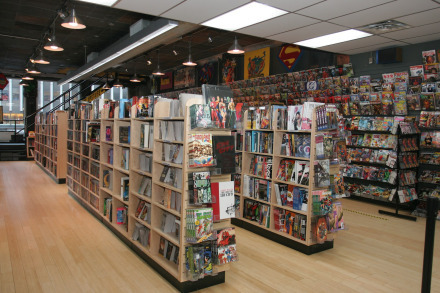 Comic shops should be an inviting place, a haven for the comic book lover. It’s made up of a great environment, engaging people, and tons of comics. I don’t have to be dazzled when I walk in a store, but I do need to know that this place is welcoming to the longtime reader and the novice. When I walk in, a store that has character stands out. Seeing it arranged neatly with posters, memorabilia, and other knickknacks makes it seem as if the owner cares about his shop and his customers. More importantly, he cares about and has the same shared love of the art of comic books that inspires the passions of his patrons. It should be a clean store, with no dust or dirt. I’ve been to stores where dust covers the books and that is a definite turn-off for someone who desires immaculate books. The owner and employees must be friendly and willing to talk and answer any questions I may have about a book. When I first started going to the store I frequent every Wednesday, I was jumping back into reading after many years. I wanted to get writer Grant Morrison’s run on Batman and needed to know which collected edition to get first if I was going to read his entire run in order. Each week, they would tell me which book to get next and I enjoyed talking to them about each book after I had read it. When I reached one book on the list of Morrison-penned books, they told me not to get it because, although it had some issues in it written by Morrison, it was not worth getting. I value honesty when it comes to recommendations. It should not be solely about selling books, but about selling quality. Quantity of books is also an integral part of a great comic book shop. When I go in every Wednesday, I like to see many copies on the stand of each issue on sale that week. I’m very particular about my books and like to pick the best and most pristine copy. That perfect copy usually resides in the middle of the stack or toward the end. I’ve valued pristine books since I was handed my first comic book at age eight. My friends and family would jokingly poke fun at my OCD-level of care over my comics. Books need to be given love and attention and placed in bags and boards to protect them. The pull list is a comic reader’s best friend. I want to be able to come into my shop and be handed my stack of new books, knowing I’m getting everything I want every week. Usually, stores will give a discount to people that have a pull list. A nice discount is a must because it’s an incentive to have a pull list and helps the store owner as well. He can order books according to demand and know what his customers like and want. Great discounts on graphic novels and collected editions are important too because it will make me not think twice about getting a book that I really want to buy. A nice variety of books is important for a shop. They should be arranged by genre or company. If I want a Batman book, I should be able to find the section with books published by DC Comics. Also, I can look for books by genre and discover a book by a non-mainstream, independent company that I wouldn’t have otherwise known about. Books on the stand should also be arranged by company, both mainstream and independent. This is another instance where the employees can be a big help in their recommendations. I asked an employee at my shop whether the first issue of Matt Kindt’s “Mind MGMT” was a good book. He said it was amazing and I bought the first issue. It’s become one of my favorite books and Kindt has become one of my favorite authors. Another reason for the store to have a nice amount of each new comic on the stand is so I’ll be able to purchase a book that might catch my eye and is not on my regular pull list. Special events and book signings are great ways to build community between stores, customers, and the creators of our beloved comic books. Interacting with writers or artists excites readers and only intensifies excitement for our shared passion. Classes or workshops are also great ways to understand and appreciate how books are created and might inspire future creators to take a chance on their own creations. New blood can be infused in the comic book world, whether they be writers, artists, or editors. The communal experience is the defining characteristic of a great comic shop. People that regularly attend a shop should feel comfortable interacting with other customers. We all love comic books and should talk about our passion freely and passionately. Opinions and ideas should flow without judgment between owner, employees, and customers. Once that happens, relationships are built and lifetime friendships can be cultivated because of our love of this great art form.